Mouse anti Human Indoleamine 2,3-Dioxygenase antibody, clone 10.1 recognizes Indoleamine-pyrrole 2,3 - dioxygenase (IDO), an enzyme responsible for the catabolism of tryptophan to N-formylkynurenine and kynurenine. With the exception of tryptophan oxidase in hepatocytes, IDO is the only enzyme that degrades the amino acid tryptophan to kynurenine. Chlamydial pathogens require tryptophan for growth. IDO can lower available tryptophan in target cells leading to conversion of the pathogen to persistant forms, with significance in the progression to chronic infection with its associated pathological effects. Peptide corresponding to amino acids 78-184 of human IDO fused to GST. OBT2037G recognizes a 45kDa band in IFN-gamma treated human cell lines.  This antibody recognizes a slightly lower molecular weight band in Mouse IDO compared to its human counterpart. Muller, A.J. et al. (2005) Inhibition of indoleamine 2,3-dioxygenase, an immunoregulatory target of the cancer suppression gene Bin1, potentiates cancer chemotherapy. Nat Med. 11 (3): 312-9. Sakash, J.B. et al. (2002) Cytokines induce indoleamine 2,3-dioxygenase expression in human atheroma-asociated cells: implications for persistent Chlamydophila pneumoniae infection. Infect Immun. 70 (7): 3959-61.